The Ghazal is an Urdu poem of passion in all its myriad hues. In its heyday, the Ghazal, thanks to the pioneering work of luminaries such as Begum Akhtar and Roshanara Begum, rightfully claimed its place among the prime semi-classical genres of Hindustani (North Indian classical) vocal music. With the passage of time and the increasingly frenetic pace of the world around us, the Ghazal gradually acquired a new identity largely within the realm of popular music. kaise keh duuN is a welcome throwback to a golden but forgotten time, that transports you to a bygone world of leisurely beauty, of weaving melodies steeped in nuanced inflections in the classical traditions of North India. 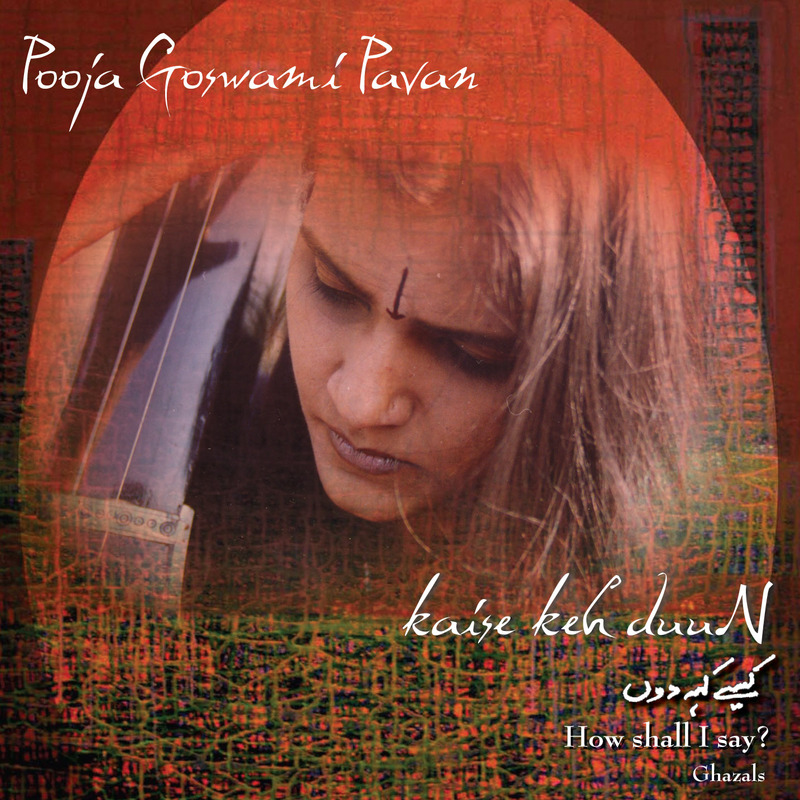 In this debut album, Dr. Pooja Goswami Pavan, Minneapolis, MN based performer, composer, teacher and scholar of Hindustani classical music, presents a rainbow of Ghazals that tunefully portray the delectably finessed poetry of some of the greatest names in Urdu Ghazal. Each musical composition owes the foundation of its tonal architecture to a principal Hindustani Raga (melodic template). Some of India's premier instrumentalists on the Tabla, Sarangi and Harmonium, complement and complete the melodic palette with their brilliant accompaniment. This confluence of sublime verse and music speaks of unrequited love, of eternal longing, of love’s triumphs and failings and of a life that was, all the while alluding obtusely, to an incessant quest for the ultimate spirit. Pooja's eminent musical Gurus, Vidushi Shanti Hiranand and Pandit Surendra Goswami, each contribute two musical compositions on this album while the remaining three compositions showcase Pooja's own creative prowess. Recorded in Delhi, India, the music is entirely presented in its raw beauty, with no edits, additional effects or post-processing, retaining the feel of a live concert setting with its inherent dynamics. In March 2006, The Hindu, one of India’s leading dailies, reviewing a star-studded, prominent Ghazal Festival in Delhi, India, commented "The young Pooja was certainly the star performer at this festival." With this album Pooja, who is a versatile vocalist, with a wide-ranging repertoire that also includes Khayal, Thumri, Dadra, Bhajan, Chaiti, Kajri and Hori among others, clearly makes her mark as one of the leading practitioners in the art of Ghazal singing in the almost forgotten classical style. The concluding evening commenced with yet another Delhi-based female artiste, Pooja Goswami's mellifluous renderings. Incidentally, Pooja has been a two-time Sahitya Kala Parishad scholarship holder, respectively, in Hindustani classical vocal music and in light classical music. She has a melodious voice with a wide vocal range and renders ghazals with intense tunefulness and total involvement with the poetic contents as well... The young Pooja was certainly the star performer at this festival.